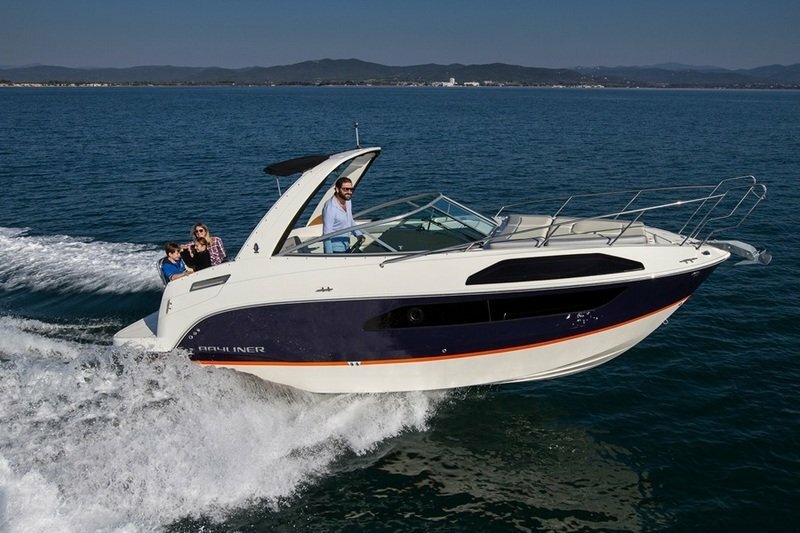 With a top speed of nearly 35 mph, the Bayliner Ciera 8 is an excellent example of the boat builder’s art. The Ciera 8 meets the need for a smaller vessel that can act as an eight-passenger excursion boat, or as a weekender for two. 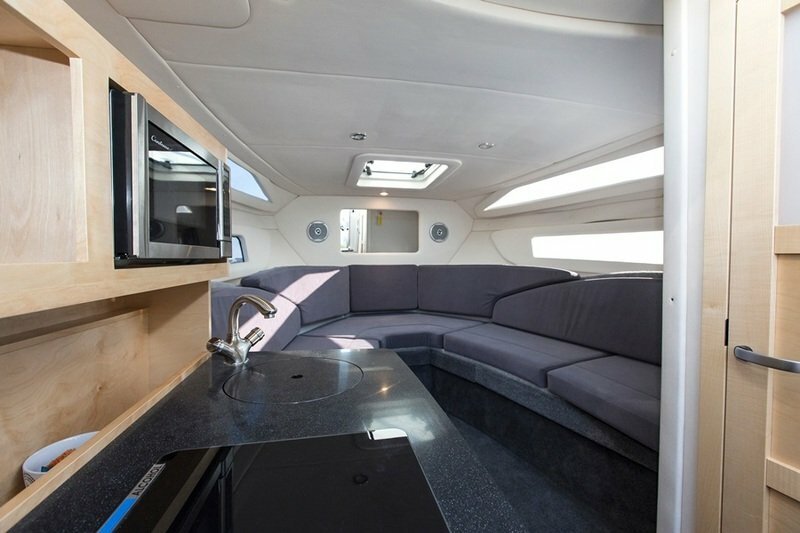 The Ciera 8 rides like a larger boat, but remains trailerable; its full galley puts it head and shoulders above those vessels in its class that lack such an amenity The Ciera 8’s layout includes an enclosed head, with shower, vanity and sink, items sadly lacking in most comparable boats, all for about $104,572. 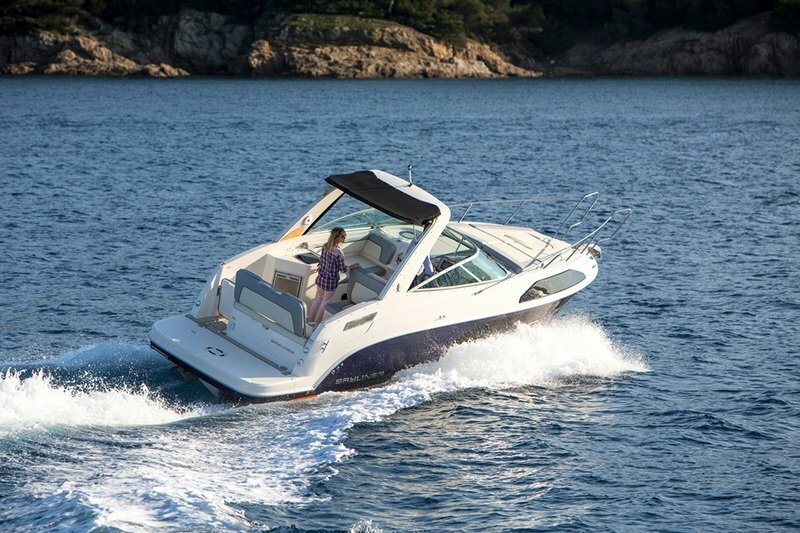 Continue reading for more information on the Bayliner Ciera 8. The Bayliner Ciera 8 has features you’d expect only on larger vessels, like an anchor roller and anchor line locker to store your anchor line out from underfoot. Just over 26 feet in length, the Ciera 8’s Arctic White hull has a matching swim platform at its stern. The swim platform’s equipped with a handle to ease your departure from the water. The locking sliding door entry provides security and the stainless steel bow rail that’s firmly through-bolted to the deck gives you a grip when working on the forward deck. The boat’s electrical system provides for 12-volt lighting, and 220-volt power is available aboard, courtesy of a power inverter when underway and a 50-foot shore-power cord when docked. The cockpit floor is self-bailing and the gunwales have vinyl molding. Water and fuel fills are located on deck. The Ciera 8’s tempered safety glass windshield and a single windshield wiper serves the starboard-side command position. Steering is a power-assisted rack-and-pinion system with a tilt steering wheel. Gauges are set into a molded, non-glare dash. Instrumentation includes fuel, temperature and oil-pressure gauges, a voltmeter, a trim gauge, a speedometer and a tachometer. The throttle and throttle-mounted trim and tilt controls are on the side of the dash. The throttle controls the reliable, 250-horsepower 4.5 L Mercruiser V-8 engine. The engine compartment is equipped with a blower, for safety. 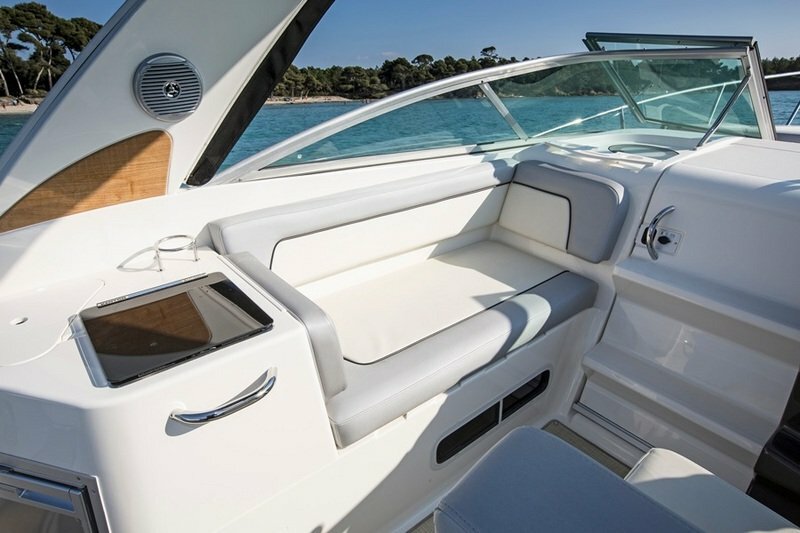 Two 12-volt outlets are available at the helm, as are the controls for the electro-hydraulic trim tabs. The engine compartment fire suppression system, while automatic, has a manual pull handle at the helm. The seat at the helm is double-width; it has an integral bolster and ample storage under its cushions. There’s a storage locker built into the transom, as well. The waste pump-out and vented fuel fittings are located in the cockpit area and, at the prow, the Ciera 8 has stainless steel towing eyes. The cockpit area has beverage holders and there is storage under the port-side lounge. Indirect courtesy lighting makes the cockpit inhabitable by night, when not underway. Elsewhere in the cockpit, you’ll find the access hatch for the engine room that, when opened, stays open by dint of a hydraulic-spring cylinder. The cockpit has an aft bench seat that converts to a rear-facing seat with the movement of a few cushions. The sliding cabin door in the cockpit leads to the cabin beneath the foredeck. You needn’t worry about water in the cockpit area, either; the decks are self-bailing. A serving area with a table is part of the cockpit’s outfit, as well. A cockpit cover is standard, for when the boat is docked and unoccupied. 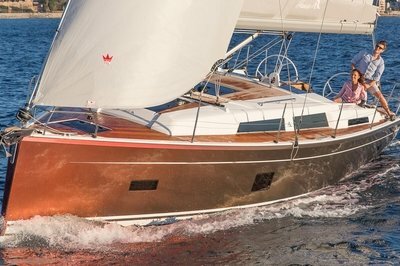 While underway on sunny days or in light rain, a Bimini top is also standard. The head is large for a boat of this size. It is plumbed to a sewage holding tank. A Porta-Potti is available as an option. The head has a screened, opening port hole, a mirror, a countertop made of teak and a towel rack. The shower and sink are part of a pump-pressurized water system that provides both cold water and hot water from the Ciera 8’s 6-gallon water heater. Dockside water fill connections are located on deck. The salon’s entertainment center consists of a 220-volt AM/FM/CD stereo-and-speaker system that’s compatible with Mp3 players. A removable folding table, for dining on rainy days, is located in the Ciera 8’s salon, as well. At opposite ends of the salon, you have a forward V-berth with cushions and drawer storage beneath. An aft berth is also present, although uncushioned. •	Bayliner’s reputation for sturdiness and quality in small craft is well-reflected in the Ciera 8. While not suitable for a bad day in the North Sea, the boat is competent in most other environments; for example, an excursion up or down the coastline or, on calm days, across more substantial bodies of water. •	The equipment aboard is basic. The holding tank is small, meaning you must take care when using the Ciera 8’s water system and you must pump the holding tank before leaving the landing. •	The Ciera 8, in spite of its size, is trailerable. •	The cockpit and deck are the best spaces on the Ciera 8. The only reasons to go below, of course, is to cook, use the head, sleep or escape weather. Otherwise, the Ciera 8’s deck space is fully accessible from the cockpit and suitable for swimming and diving, fishing or simply gazing over the water. The Bayliner Ciera 8 is a marvelous boat for the price. It offers essential features in a compact form, can take on most moderate weather and sea conditions and is more than suitable to support any watersport, from skiing and wakeboarding, to more tranquil pursuits like fishing.